Christos Gage is one of my favourite writers, from his work on Angel & Faith, G.I.Joe and Superior Spider-Man among others. Most definitely one of the best writers in the industry right now. When I heard that he was going to be penning at least one issue of The Flash with regular writers Manapul and Buccellato having moved on to other projects, I was quite ecstatic. I love what they did with the series despite my earlier concerns, but I was ready to welcome a new voice to the series, and Christos Gage and Neil Googe do exactly that. Their take on the scarlet speedster is consistent with his portrayal under the previous team, and it is also its own thing, which is great as well. 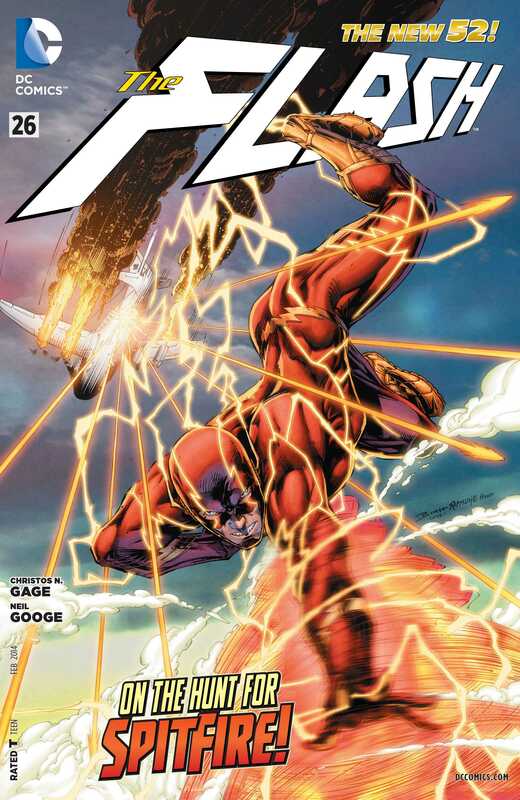 Where the previous arcs have dealt with some of Flash’s major villains, this one-shot takes a step back and focuses instead on a minor one, thrill-seeker and former stunt pilot Spitfire who is now in the business of stealing extremely dangerous pathogens and is also a cold-blooded killer. When we start off, we find that she’s killed someone close to Barry in the middle of one of her heists and now he’s after her to bring her back in cuffs and retrieve what she stole. What impressed me here was that Christos really does get Barry’s character. Very much like how Jeff Parker wrote Aquaman #26, Christos has written The Flash #26 as if he’s been on the title since day one. The transition from the regular creative team to the fill-in (for now) team is quite seamless and I love that. Christos has some really good moments in the issue where he uses Barry’s powers very creatively and gives them more depth and nuance beyond the obvious. And his writing is a bit technical as well, with all the little science facts sprinkled in. It all makes for some really good reading all the way through. Spitfire as a villain doesn’t get room to do much, especially since she’s only around for this one issue, but it all works out well in the end. She’s feisty and smart and a bit of a talker as well. Christos writes her with a fair bit of depth and nuance, with the focus throughout on her relationship to the Flash. In the hands of a less talented writer she’d be a Sunday morning cartoon villain cliche, and thankfully that is so not the case here. I wouldn’t be averse to seeing her pop up again, especially given her resentments against Flash for always being around and her not being able to get rid of him no matter what. Neil Googe’s art isn’t as good as what I saw from Manapul and Buccellato previously. His lines are not as sharp or crisp, his expressions can really get weird at times, not matching the dialogue/scene properly, and this can jar quite a bit. But overall, he draws both the Flash and Spitfire really well. The latter’s sunny disposition really is captured well, it must be noted, even if it can gets a bit overdone. Wil Quintana is the colourist here and that aspect of the comic was a little off for me. In some cases, such as the yellow lines on Barry’s costume, the colours are too bright, and in other cases the colours are a bit too… muted/muddy and they don’t really pop. Not to mention that in a lot of the panels the inking is on the heavy side. So, all the little things aside, The Flash #26 ends up being a really good read and as long as the art issues are worked out, I’d love to see this creative team again. More The Flash: Annual #2, Volume 4, #23.1, #23.3, #25. Posted on January 4, 2014, in Comics Reviews, Review Central and tagged Barry Allen, Christos Gage, Comics, Comics Review, DC Comics, Flash, Neil Googe, New 52, Review, Review Central, Spitfire, Superheroes, The Flash, Wil Quintana. Bookmark the permalink. 4 Comments.